Halloween coloring pages can be fun for younger kids, older kids, and even adults. There are hundreds of free Halloween coloring pages here and they're so simple to print from your home computer, you'll be done in just a few minutes. These Halloween coloring pages can be a great craft activity for the kids and when they're finished the coloring pages can be hung all over the house as instant Halloween decorations. If you're looking for some Halloween coloring pages strictly about pumpkins, you'll want to check out this list of free pumpkin coloring pages. I also have a list of free fall coloring pages that feature all kinds of Autumn images. Print out the Halloween coloring pages on cardstock or computer paper for the best look. You can find more free Halloween activities for kids, Halloween printables, Halloween party games for kids, and pumpkin carving patterns. You'll love the Halloween coloring pages at Raising Our Kids because they make it so easy to find just what you're looking for. You can easily browse categories like Kids at Halloween and Scary Pages to find the perfect coloring page for your kid. Use the print icon at the top of the image you'd like to print to get just the image on the printed page. There are 11 pages of free Halloween coloring pages at PapaJan.com! With all these choices, you're sure to find the perfect ghoul, jack o' lantern or haunted house for you. Click on the thumbnail of the coloring page you'd like to print and then click on the image again to print the sheet without an ad. You'll find a ton of Halloween coloring pages here. This is a great collection of goblins, witches, pumpkins, ghosts, and other Halloween images. There truly is something for everyone. Be sure to click on the image twice to get an ad-free version of the image before you print. The Halloween coloring pages at DLTK are a mixture of spooky, adorable and just plain fun! Be sure to click on the categories at the bottom of the page to see even more Halloween themed coloring pages. To print the Halloween coloring pages here, just click on the thumbnail of the coloring page you'd like to print and click No Ad Version to get a full sized image you can print. What sets the Halloween coloring pages apart at Apples4TheTeacher is that they are online coloring sheets. Use the marker to select your color and click to color in the spooky images. You can then use the Full Page Print icon to print the page after (or before if you'd prefer) it's been colored in online. All the Halloween coloring pages here are interactive and online! Click on the Halloween image you'd like to color and use the tools to color the picture just how you'd like. If you'd rather see more free printable Halloween coloring pages, they've got those as well. Geared towards preschoolers, you'll find some great Halloween coloring pages here. It's really simple to print these coloring pages, just click on the title and you're ready to go. Besides the average Halloween coloring pages that feature bats and spiders, you'll also find coloring pages here that help teach kids their letters. These special coloring pages feature a fun Halloween image to color as well as a tracing guide, the uppercase and lowercase version of the letter and the word spelled out. What a fun set of online Halloween coloring pages! Once you find an image that you like, click on it and use the tools to color in the image. You can even choose a texture for your colors. When you're finished coloring in your Halloween creation, click Done and then you can either email, print or save the image you've created. You'll love the spooktacular Halloween coloring pages at MES English. To print these free coloring pages, click on an image and then click the printer icon at the top of the Flash window. The Halloween coloring pages here are organized by category making it very easy to find just what you're looking for. Don't worry, the ads won't show up when you print these Halloween coloring pages. There are 3 pages of free Halloween coloring pages at Super Coloring. From the spooky to the fun, there's something for everyone here. You'll need to click the image twice and then click No Ad Version before you can print the image as a coloring page. There are some adorable Halloween coloring pages here that feature witches, monsters, ghosts, bats, and pumpkins. You'll need to click on the image twice before printing. The ads won't show up once you've printed the page. There are a lot of Halloween coloring sheets here. You'll find some very unique ones as well including a Halloween fish and a ghost with a carrot nose. Be sure to click on the image to print it without the ad. Halloween Coloring Pages at Woo Jr.
A lot of the Halloween coloring pages at this website feature animals. Be prepared to see a lot of black cats and bats. Don't miss out on the Gargoyle Halloween coloring pages here! There are lots of free Halloween coloring pages at HelloKids.com and they're organized nicely into categories of Halloween characters, Halloween costumes, scarecrows, Dracula, skulls, spiders, skeleton, haunted castles, ghosts, pumpkins, bats, monsters, witches, trick or treat, Halloween parties, and black cats. You can print out all these Halloween coloring pages using the Print button or you can choose to color them online. 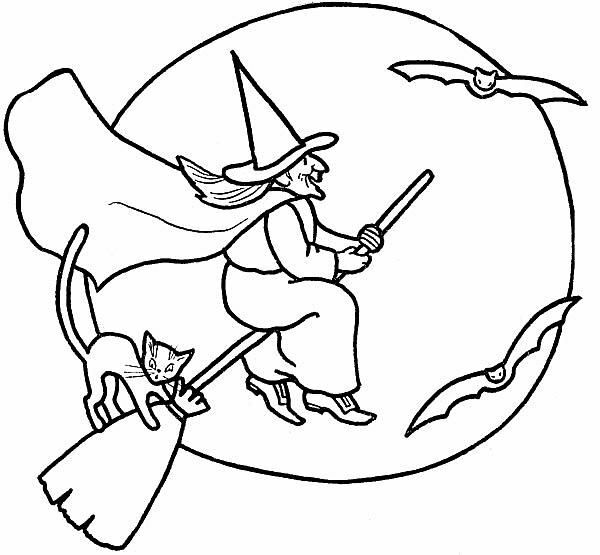 There are Halloween coloring pages here that feature cats, pumpkins, monsters, witches, wizards and ones that are just plain cute. Scroll down to find more Halloween free printables such as puzzles and scavenger hunts. A nice collection of 20 free Halloween coloring pages. 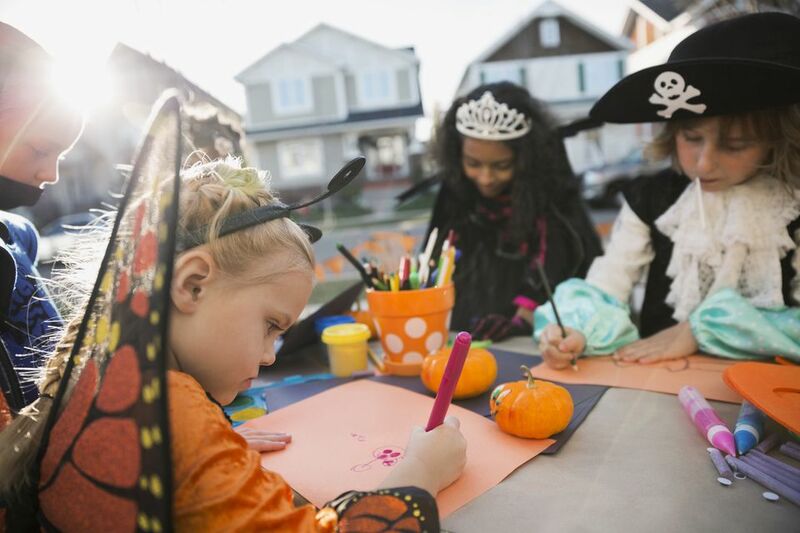 You'll find Halloween coloring pages of ghosts, trick-or-treaters, pumpkins, cats, scarecrows, Dracula, witches, haunted houses, treat bags, Disney characters, Sesame Street characters, and more. A great collection of unique Halloween coloring pages awaits you here. Besides free Halloween coloring pages, there is also free activity sheets and color by number sheets. Class Brain has a great collection of free Halloween coloring sheets along with a few ideas on how to decorate them in some different ways. Each Halloween coloring page is printed as a worksheet with room for the student's name, class, teacher, and date. Here's a great list of original Halloween coloring pages that you can either color online or print out. You'll find Halloween coloring pages of graveyards, haunted houses, skeletons, pumpkins, mummies, bats, ghouls, and a whole lot more.